Give this design a name! 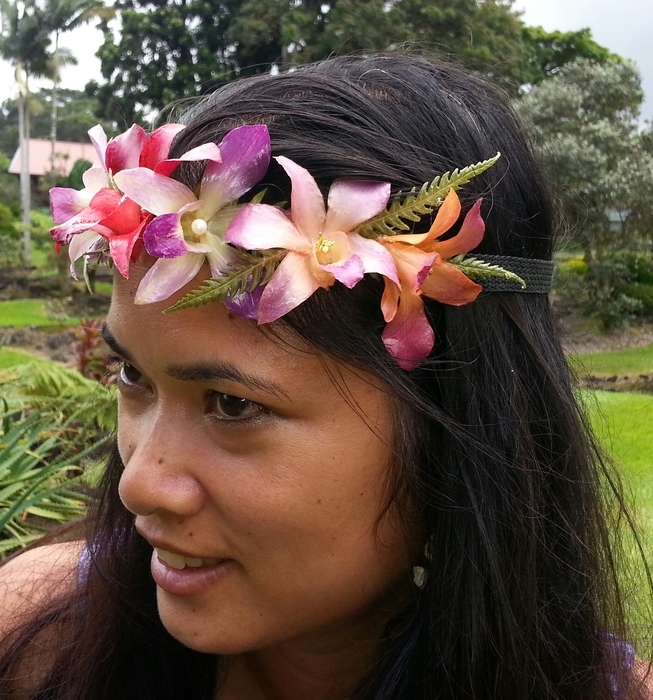 Eden Patino (pronounced Edden by the way) is a striking lady under any circumstances and all the more so when bedecked in my rainbow of colorful preserved orchids making up the featured head lei selected for my 2014 “Name this Design” competition. The event drew an enthusiastic response from a flatteringly large number of attendees, of both genders.The competition invited suggestions to name this design, the winner to select from any item on my display as their prize and thank you for his or her contribution. All other participants were offered a substantial discount from any items they may choose to buy from my website before the end of the year, unlimited by how many items or how often they might purchase. Such was the response that it became very difficult to select the winner. Consequently I resorted to inviting all who had originally submitted a suggestion, to examine a short list of seven wonderfully appropriate names chosen from the well over forty submissions. They were asked to name their first and second preferences. 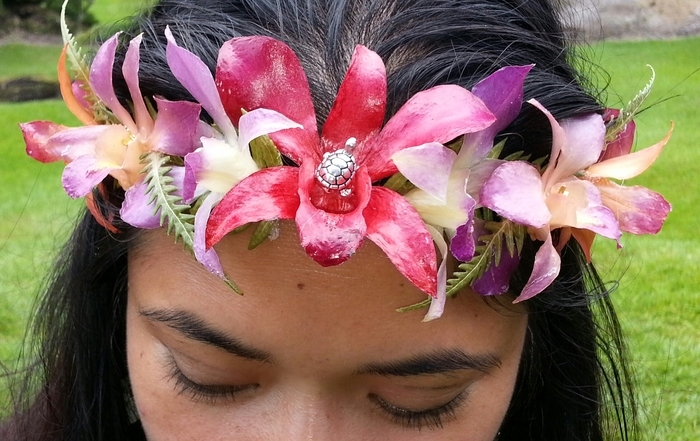 Ultimately, through this “democratic” selection process it was Aleysia-Rae Kaha who won with “Lehupulu” as featured here. Aleysia is a delightfully modest young lady such that I do not have any photo of her. I’m working on that! Thank you everyone who entered into the spirit of this event. I will repeat this next year with a very different design with similar incentive prizes, and hopefully there will be an even more enthusiastic response. Looking forward to seeing you all there next year!